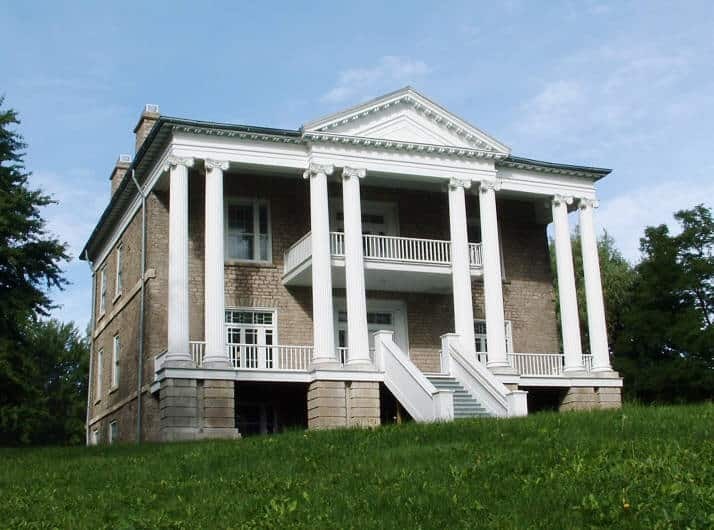 Willowbank National Historic Site is one of the undiscovered jewels of the Niagara Peninsula. Its curved entrance drive keeps it mostly hidden from the hundreds of thousands of people who pass by its gates every year – people using the Niagara Parkway to make the connection between Niagara Falls to the south and Niagara-on-the-Lake to the north. But for those who enter, it is a special world, a place where the many layers of its rich history seem tantalizingly present. In pure physical terms, it is a very romantic site. The beautifully designed Greek Revival mansion is set within acres of lawns and mature trees. The interiors have the kind of decay that keeps revealing more and more of the past as present layers are peeled back. The ghosting of the original carriage drive up the hill from the east adds to the sense of a still-tangible mid-19th Century reality. And along the north side is the deep ravine, part of a First Nations portage route around Niagara Falls for thousands of years, and now a fragile ecosystem with its own sense of mystery. The estate has been a designated National Historic Site by the Historic Sites and Monuments Board of Parks Canada. It is also one of the richest archaeological sites in southern Ontario. It is a perfect laboratory for the Willowbank’s students and faculty associates, whose task is not only to investigate and conserve its past but to give it an equally rich future. Part of that future is opening up the estate to more visitors, allowing more cultural events, private functions, and special occasions on the grounds and within the main house and the barn complex. A Saturday morning lecture and discussion, a weekday evening candlelit dinner with visitors in the Bright parlour, a seminar session or conservation workshop in Reif Hall, a jazz festival on the lawns – all of these allow the history of Willowbank as a place of human habitation and exploration to continue. Willowbank is home to the School of Restoration Arts dedicated to the teaching of all arts and skills related to the conservation and restoration of historic properties. The school delivers heritage conservation programming through its Lecture Series, Audit Program and its unique three-year full-time program which accepts up to twelve students a year and offers an education program that balances theory with practical, hands-on experience. Many subjects are studied with more than 50 faculty members from numerous disciplines within the heritage field including crafts-persons, historians, architects, heritage consultants, archaeologists, artisans and landscape architects. The Willowbank estate, with its complex layers of history and design, is both a teaching venue and a working laboratory for conservation activity. Public Tours: During the spring and summer months. Please contact us for current schedule.